Come to visit Cathedral of Santiago de los Caballeros, in the Dominican Republic. 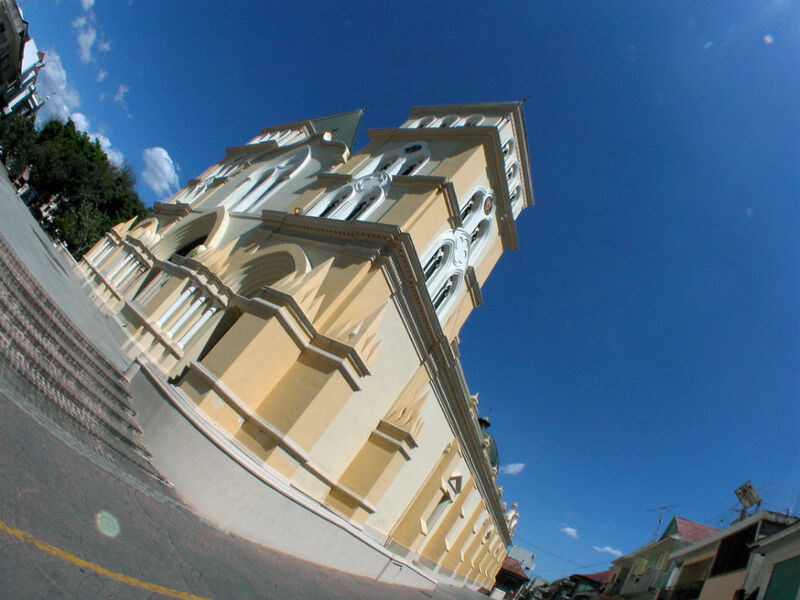 On your trip to the Dominican Republic, you cannot miss the chance to visit Cathedral of Santiago de los Caballeros and learn about the history of this beautiful building from the mid-nineteenth century. This cathedral is built in the same place where a church disappeared after being devastated by the earthquake of 1842. It was rebuilt in 1851, but it was damaged again during the War of Restoration. This happened in 1863, when the soldiers were sheltered there and made small windows in its walls in order to defend themselves in combat. In 1868, it became the temple that we have today. It was consecrated in 1895, and blessed again at the beginning of the 20th century. The 1946 earthquake caused cracks in the structure of the cathedral. That day the bells rang by their own. Also, due to the earthquake, some of its arches were damaged. Osiris Delgado, a Puerto Rican intellectual, wrote about this cathedral: “Full of romanticism with its neo-Gothic features and at the same time flaunting neo-classical features, it could be said that it displays signs of passion and reason, faith in God and belief in rationality; all of it is the symbol of a country trying to survive against limitations and adversity. Symbol of the city itself, it stands out proudly and with reckless stubbornness against the possibility of calamities ". Inside this cathedral, one of the two copies of "La Pietà" by Michelangelo is preserved. In addition, it houses the remains of the former President Ulysses Hereaux, the general José María Imbert, Pedro Antonio Pimentel, Fernando Valerio and Lucas Evangelina de Peña. The structure of the cathedral consists of three naves: the oldest has a barrel vault, and there is a dome in the apse, whose pendentives are decorated with paintings of the four apostles, drawn by the Italian artist Hugo Nardo. Its facade, work of the sculptor Gaspar Mario Cruz, is decorated with allegorical motifs of the life of Jesus and the Apostle Santiago, and the Battle of Santiago held on March 30, 1844. On is interior, bare bricks are used as completion in certain parts, which does not cease to astound. At the corner between 16 de Agosto and 30 de Marzo streets, Santiago de los Caballeros, Dominican Republic.